Stir the chocolate and heavy cream in a microwavable bowl. Microwave on HIGH for 1 minute or until the chocolate is melted. Stir until the chocolate mixture is smooth. Place 1 teaspoon chocolate mixture into each pastry cup. 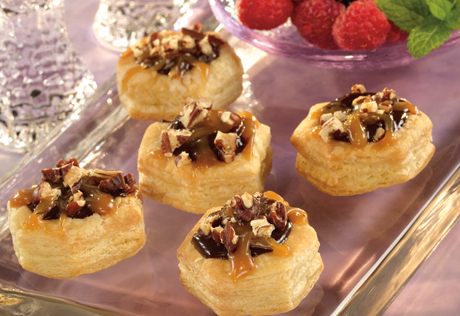 Drizzle with the caramel topping and sprinkle with the pecans.